LG's newest top-tier champ, the V10, is here. At first sight, it looks like it doesn't skimp in any aspect: it comes with a 5.7-inch QHD display, hexa-core Snapdragon 808 chipset (not exactly the creme de la creme, but at least not plagued by issues like the SD810), an Adreno 418 GPU, 4GB of RAM, a microSD card slot, and a removable 3,000mAh battery. Additionally, we have a 16MP rear camera with OIS 2.0 and a aperture of f/1.8 that will most probably live up to the qualities of LG G4's one. Judging from these alone, it's safe to deduce that the LG V10 has lots of potential and can compete with almost any smartphone out there in a pure specs sheets comparison. How does it compare with the hot-new Nexus 6P and the Galaxy S6 edge+, in particular? 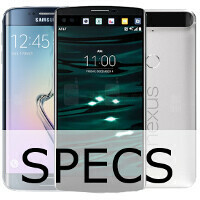 We decided to come up with a specs comparison between the three and inspect the differences. You too can do so right below. I don't think the secondary screen is count in as 'screen' on screen-to-body ratio. Lg only has about 70% without the ticker. Why shouldn't it count? It is still screen after all. As a matter of fact, the ticker is not even separate from the main display, it is part of it. It should efinitely count as screen. The V10 has a secondary ticker screen which counts as part of the total amount of screen. Therefore, the extra space that ticker display takes up still counts as screen, giving it a better screen-to-body ratio.